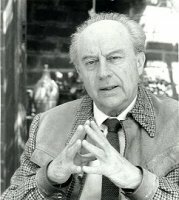 Johannes Jacobus Degenaar was born on 7 March 1926 in Ladysmith. He studied at Stellenbosch University (MA, Kennis as Lewe, 1948 and DPhil, Die herhaling van die vraag na die filosofie, 1950), and at the universities of Groningen, Leiden, Oxford, Berlin and Heidelberg. From 1949 he lectured at the Department of Philosophy of Stellenbosch University, became a professor in 1969 and was Head of the Department until his retirement in 1991. In the fifties and early sixties Johan Degenaar gave an honours course on Kierkegaard. This course and writings on Camus and Heidegger, acquainted South Africans with the world of existentialism. In the fifties he also started to engross himself in the problem of secularization (taking up the prison correspondence of the late Bonhoeffer) which led to his book Die Sterflikheid van die Siel, (The mortality of the soul). This created tensions with the authorities of the Dutch Reformed Church. Eventually, a separate Department of Political Philosophy was created under Degenaar's chairmanship in the mid sixties. During this time, his writings are characterized by uncompromising denunciations of apartheid ideology and by an intellectual assessment of the idea of a plural democracy and its viabilty in the South African context. In the battle against apartheid, during which he was ostracised and vilified as a traitor by fellow Afrikaners, he became the embodiment of intellectual honesty and moral integrity. Other themes discussed in his work are structural violence, ethnicity and Afrikaner thought. In 1958 he formed a conversation groupof mostly non- Broederbonders, who regularly met in his house. During the late seventies, Johan Degenaar turned to aesthetics and literary theory and his lecture course in the eighties is regarded as one of his most valuable philosophical contributions. His most recent research deals with models of nation building. Johan Degenaar was married to Jetty Maria, née Houtman, and they had two sons, Hans and Marc. Jetty died in 2011. Johann Degenaar died on 22 July 2015 at Helderberg Village, Somerset West. ...op Stellenbosch het ek as student in die filosofieklasse van Johan Degenaar opnuut geleer wat verwondering is. Deur die persoonlike invalshoek waaruit hy gedoseer het, moes 'n mens noodwendig bewus woord van jou verbondenheid aan die aarde, nie as vloek nie, maar as seën; nie as knellende noodlot nie, maar as opwindende bestemming. .... Vandag besef ek dat die lewensbeskouing waaran ek van die begin af in my poësie uitdrukking gegee het, ten diepste gevorm is deur Johan Degenaar. December 2006: The book Gesprek sonder grense was published to honour Johan Degenaar on his 80th birthday. Johan Degenaar published over 150 articles in scientific journals and a dozen book contributions. His publications range from monographs on N. P. van Wyk Louw, de Chardin, and Camus,to philosophical anthropology and political philosophy. He was also involved in making a film on the psychology of fairy tales: "Understanding Little Red Riding Hood".